Softklone's original Mirror was designed to be a clone of Crosstalk, a popular business communications program. The latest version of Mirror, although completely compatible with Crosstalk XVI, offers a number of substantial improvements: additional file-transfer protocols, MNP support, a built-in text editor, a background mode, mouse support, and much more. Best of all, Mirror HI costs less than Crosstalk XVI ($149 rather than $ 195). Mirror Ill's status screen lets you view parameter settings and includes a command line for entering two-letter mnemonic commands, such as NU (NUmber), CA (CApture), RX (Receive XMODEM), and EM (EMulate). 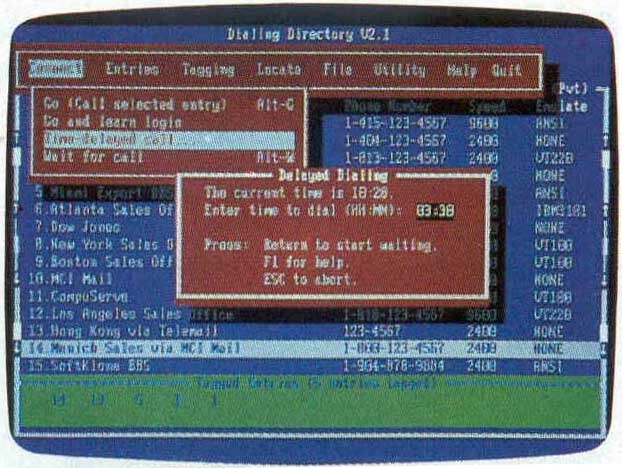 Mirror Ill's Dialing Directory features easy-to-use pull-down menus. The dialing directory provides easy access to a list of phone numbers and can indicate system names, transfer rates (such as 1200 or 2400 bits per second), formats (parity, data bits, duplex, and stop bits), and scripts (if you're using them). Mirror provides an unlimited number of directories and entries within directories and lets you chain-dial as many as 30 entries at a time. You can access the commands necessary for just about any online session with the easy-to-use pull-down menus. Beginners will especially like the newuser option, which will write a script to get you online with databases you're currently using, such as CompuServe, NewsNet, Delphi, MCI Mail, and Dow Jones. For systems not listed, you can use the learn command, which watches you log on to a system and writes a log-on script. Experienced users will appreciate the variety of file-transfer protocols, including XMODEM, YMODEM, Kermit, Crosstalk, Hayes, Compu-Serve-B, and CommPressor. Support for ZMODEM is included through a shareware program ($20 to register) that's provided with the package. Mirror's PRISM script language is an expanded version of Crosstalk XVI's script language and is upwardly compatible. PRISM'S most significant improvement over Crosstalk's language is its ability to run script programs in the background. There are many other features, including the ability to capture all or part of an online session to memory, disk, or printer. A backscroll command lets you recall text that has scrolled off the screen. A host mode lets other computers call your computer, leave messages, and down- and upload files. You can also redefine your computer's function keys. Mirror III is well supported with frequent software upgrades and an excellent BBS. It has a 60-day money-back guarantee, and it gives you a lot for your money. You're not likely to outgrow this program.